The 16 Guidelines are a set of practical and straightforward tools for developing happiness and meaning in everyday life. Inspired by a seventh-century Tibetan text, the 16 Guidelines are used by people worldwide to transform problems and create happiness and wellbeing. Since then, they have been adopted and introduced in schools, colleges, hospices, drug rehab centers, prisons, and workplaces across five continents.Songtsän Gampo (Tibetan: Srong-btsan sGam-po, 569-650 or 617-650) was the founder of the Tibetan Empire, by tradition held to be the thirty-third ruler in his dynasty. The dates of his birth and when he took the throne are uncertain. In Tibetan accounts, it is generally accepted that he was born in 617 (one year before the founding of the Tang Dynasty, when Gaozu of Tang became emperor of China). He is thought to have ascended the throne at age thirteen (twelve by Western reckoning), in 629 CE. 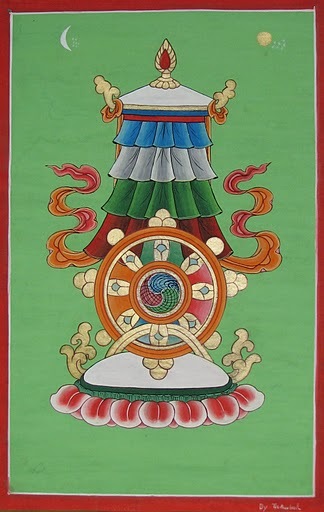 Songtsän Gampo is regarded as an incarnation of Avalokiteshvara. He married two princesses, Bhrikuti of Nepal and Wen Cheng of China, who each brought a sacred statue of Buddha Shakyamuni to Lhasa. He built the first Buddhist temples in Tibet, established a code of laws based on Dharma principles, and had his minister Thonmi Sambhota develop the Tibetan script. During his reign, the translation of Buddhist texts into Tibetan began. King Songtsän Gampo built Rasa Trulnang Tsuglag Kbang and Ramoche Tsuglag Khang, two temples in Lhasa. He invited Acharya Kumara and Brahmin Shankara from India, and the Nepalese Acharya Shilmanju, who began the propagation and translation of the Buddha’s teachings. The 16 Guidelines are based on the inspirational values and principles that King Songtsän Gampo introduced to the Tibetan people. They played a crucial part in transforming Tibet from a warlike nation into a civilization renowned for its peace and serenity. The 16 Guidelines of King Songtsän Gampo have a complex history. Different versions have been developed over the past thirteen centuries, including a rare set of verses called The Necklace of Precious Advice by Gelong Wangchuk Chösang, which forms the basis for this presentation. The 16 Guidelines continue to be recited by young monks in the great monastic schools of Tibet, India, and Nepal and have functioned as elementary ethical instructions for countless Dharma cultivators. The two foundations for happiness are wisdom and compassion. Compassion is the primary attitude leading to personal and collective happiness. Wisdom, defined as an understanding of our mind and of the world in which we live, is a key factor in developing compassion. The aim of a 16 Guidelines Study Group is to facilitate changes in the minds of participants in the direction of happiness, through wisdom and compassion. A full mind is like a full cup; it cannot contain anything new. To make ‘space’ for learning, we need to empty the mind through a brief meditation before starting. It is also important to consciously set up a positive motivation. The change needs a direction. This can be achieved through hearing and discussion. Simply consuming facts does not change patterns of thinking. This can be achieved through concentrated analysis of the content. This can be done by consciously practicing the content in daily life. Please apply a ‘three-step’ procedure to the study of the 16 Guidelines: hear, reflect, and contemplate. Hearing refers to accepting the Guidelines provisionally, without mental argument. The Dharma does not require (or condone) ‘blind faith’ and passive acceptance —on the contrary, it promotes active examination. However, in order to understand (under–stand = to stand under), please defer judgment until such a time as you develop the capacity and experience to make an informed decision. This is not possible without initial provisional acceptance of the Guidelines, at least as a hypothesis to be tested. Reflecting refers to exploring the essential meaning of what is said, ‘above, beneath, and beyond the words’ used to present the Guidelines. It requires an act of personal ‘translation, re-translation, and back-translation’ of the terms utilized, endeavoring to understand the intended meaning. Contemplating refers to the systematic application of the Guidelines to various situations and circumstances in your life, the lives of others, and the context in which these manifest. You can begin this aspect of the practice by exploring past events in light of the Guidelines, progress to an examination of current events (in your own and the lives of others), and eventually attempt to ‘foresee’ future trends in light of the Guidelines. Analytical Meditation is practiced by addressing each Guideline individually during at least one session, or until you are satisfied with the effort. It is important to reserve judgment on any individual Guideline until you have a clear understanding of its inter-relation with others. The Guidelines offer a perspective, a principled approach to conduct, and not a set of pre-ordained and fixed rules. You read one Guideline at a time, and accept it provisionally —as a hypothesis, much like you would in a scientific experiment. This is hearing. Reflecting means that you think of what is meant by the words used to express the Guideline. Words are symbols; they attempt to communicate an idea —what that idea means is how you interpret it, what it says to you personally. How would you state this Guideline if you were presenting it to others? Does it match how you have habitually seen the world? Does it offer a different perspective? How is it similar? How is it different? Are the similarities or differences a matter of degree? Is the Guideline more or less like or unlike your habitual perspective? Does the Guideline offer a radically different point of view? Proceed to contemplate how that Guideline explains or adds insight to your own experiences in the past and present, and eventually how it could inform actions you may perform in the future. The purpose of the practice is to challenge how you habitually see the world, and consequently your patterns of customary behavior. Ultimately, it does not matter whether you accept or reject the Guideline. Just adopting it provisionally, seeing how it would change your evaluation of past and present experiences —and how it might inform future activity— will accomplish that goal. The fundamental problem with fixed or habitual perspectives is that one constantly applies old perceptual and behavioral patterns to new situations. Regardless of how successful those patterns may have been in the past, they necessarily limit your options in the present, as they do not allow for a fresh evaluation of the current situation and an unbiased selection of appropriate responses. A person may have learned to drive a car in a very congested city, where aggressive driving was the norm. If that person continues to drive in that manner in a different environment, where people are used to more courteous driving, unnecessary dangers may arise. A person living in a harsh northern climate may have limited food choices, and may settle on a diet which may be deficient in fruits and vegetables, but is the best possible option given those circumstances. However, if that person relocates to the tropics, continuing that pattern of eating most probably is no longer the best option available. A child that is abused in the home may develop a defensive attitude that leads to isolation from others. While that strategy may protect the child by minimizing opportunities for abuse, later on in life that person (now an adult) may continue the pattern of isolation, when it is no longer protective. Through Analytical Meditation, you will be systematically dislodging those patterns and replacing them with more beneficial perspectives. Please postpone any consideration of whether these Guidelines are ultimately true or not, because fundamentally the purpose of the practice is to accept that there are other ways of perceiving the world and acting in it. There are many different ways to develop a mental state conducive to Analytical Meditation. If you are distracted or agitated emotionally or mentally, be it from work, traveling, or interacting with others, it is very important to first attain a neutral state. This will help you to relax. Breathe normally through the nose —not too quickly, not too slowly; deeply, but not too deeply. First breathe out, then allow a very slight pause. Because of that slight pause, you will naturally inhale more deeply, which is a much more relaxed way of breathing deeply than consciously forcing a deep breath. As you inhale, count each breath silently. Then, without holding the breath, exhale. Repeat this cycle eleven times, and then repeat the full count of eleven two or three times, depending on how relaxed you feel. The numbers don’t really matter; you can count up to any number. The purpose is to occupy the verbal energy of your mind, so that you are not thinking something else while focusing on the breath. Once you have attained a neutral state, make your energies, mind, and emotions positive. You can do this by affirming your motivation. Why are you engaging in this practice? What do you want to gain or accomplish? You are meditating to accomplish something practical. You meditate to try to help yourself to develop beneficial views and habits. You are not doing it merely because you are following an instruction. You are doing it because you are convinced that it will be beneficial, or at least you have enough confidence to attempt it for some time. You would like to be able to deal with difficulties in your life more skillfully, and not just make your life a little bit better. Eventually, you would like to become free of all difficulties. You would like to become enlightened so that you can be of real benefit to yourself and all sentient beings. Although your ultimate goal may be liberation and enlightenment, it is not going to happen overnight. Miracles normally do not happen —they are called “miracles” because they are rare. These Guidelines are not magical. Your practice will not suddenly free you from all suffering. As you know from experience, moods and events in life go up and down, and they will continue to go up and down. With diligent practice, things will get better in the long run, but from day to day, you may continue to have difficult moments. If you approach learning the Guidelines and practicing them in daily life in a realistic manner, you will not be discouraged. Even when really difficult things do come up, and even if you still get upset, you will not be thrown off course. This is your motivation, your aim. This is your understanding of what you can gain from practicing Analytical Meditation. Whether you feel better a half hour after the meditation or not is not the point. You want to pursue a certain direction in life, and this practice will move you in that direction. That direction is liberation and enlightenment, the union of wisdom and compassion. Each time you meditate, you take another step in that direction, despite the ups and downs. That is realistic. May what we’re about to do yield favorable results. May it give us the capacity to benefit others. May it help us overcome ignorance and limitation. May it clear away all obstacles on the path. May it lead us to the union of wisdom and compassion. Please make the conscious decision to meditate with concentration: if your attention wanders, bring it back to the meditation. To help your mind remain clear, sit up straight. If there is too much laxity, raise the gaze upwards (the head remains level). If there is too much excitement, lower the gaze (again the head remains level). Meditate on each one of these 16 Guidelines, focusing on just one Guideline for one whole week. At the end of the initial 16-week cycle, please return to the first Guideline, and repeat the practice, focusing on a different Guideline every day. After each session of Analytical Meditation, try to remain in a state of calm awareness for a few minutes. If many thoughts come to your mind, you can repeat the breathing procedure utilized as a preliminary practice. When you are ready to resume your daily activities, conclude the session by dedicating the merit of your efforts to the well being and happiness of all sentient beings. Dedication is an essential procedure, as it not only prevents the loss of merit, but actually increases it exponentially. An example can illustrate this reasoning: if I find some coins and put them in my pocket, there is the possibility (or perhaps probability) that three things may happen: I may spend them, lose them, or they may be stolen. However, if I immediately give them to another for safekeeping, these possibilities no longer exist. Furthermore, as you are a sentient being, by dedicating the merit of your virtuous acts to universal welfare, you are not excluded from the benefit. On the contrary, your generosity will amplify that merit, and serve to reduce whatever karmic debts you may have contracted with others in this or previous lives. May all embrace happiness and the causes of happiness. May all abide in peace, free from self-grasping. May all attain the union of wisdom and compassion. What is Analytical Meditation? How is it practice? Analytical meditation is a contemplation on a particular teaching. It differs from ‘regular’ meditation in that it explores a topic, while meditation is merely resting in the empty luminosity.